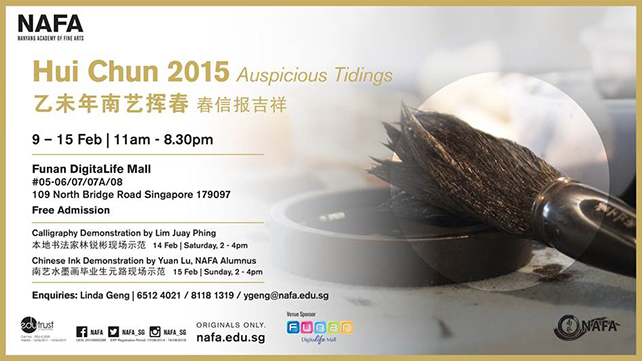 NAFA celebrates the Year of the Goat with an exciting array of Chinese calligraphy and ink paintings at Funan DigitaLife Mall. A festive array of works from established alumni, students as well as master painters and calligraphers will be featured. Live demonstrations will also be held on weekends. Do come and pick up a few pieces of auspicious couplets or ink paintings to usher in the Lunar New Year. Your purchase will benefit the NAFA Development Fund and you will enjoy tax deduction for 2.5 times of 70% of the purchase price.